At an age, 85, where she is virtually without musical peer, who could imagine a jazz singer sounding as vibrant, aggressive and progressive as she did in her hit-filled 20s? That's Myra Taylor. Prepare to be amazed. 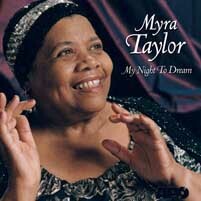 With My Night To Dream, Taylor brings to the contemporary jazz scene a vivid glimpse of the past. This is the same Myra Taylor that scored chart-busters for Mercury Records in the 1940s. Some of those hits - most notably Spider And The Fly, Take It Easy Greasy and Still Blue Water - are redone here. And to some that are familiar with Myra's career, these takes sound better than the originals. Perhaps this shouldn't be so amazing, but to those who have heard this release so far, it has been. Returning to the studio after a hiatus of over 50 years, Taylor has reclaimed her music. She also was inspired to write again. The result was Hey There, a coy invitation penned especially for the session. Taylor rounded out the record with a choice selection of jazz and blues standards, including her signature songs, This Is My Night To Dream and I Don't Want To Set The World On Fire. Taylor's rich tone and resonant delivery are perfectly complimented by the crack band drawn from Kansas City's top players and jazz legends. My Night To Dream was recorded in Salina, Kansas at Blue Heaven Studios, the home of APO Records and just a few hours drive west of Taylor's Kansas City home. As has become the Blue Heaven norm, this recording reflects perfectly why this studio in a converted church has won national acclaim for its astounding acoustics. The natural ambiance only enhances the charisma that is so much a part of a Myra Taylor performance. With a new recording and legions of fans and friends, Taylor is not content to rest on her hard-won laurels. She is busily looking to the future and performing regularly, writing new songs and preparing for her next recording session. Recently, Taylor bought a new set of luggage and renewed her passport. Smiling broadly, she said, "you'll never get to Paris unless you go to France." "Beautifully sung and sympathetically played blues and jazz standards like these don't come around too often...Taylor simply couldn't wish for better support both here and with the technical expertise on offer at Chad Kassem's Blue Heaven Studios. This vibrant and lively church acoustic, together with her closely miked voice, has immediacy and plenty of fine detail that radiates throughout all twelve tracks."